There are many options when it comes to premium automatic pool cleaners, but many people have been drawn to the 2018 Dolphin Premier. One of the biggest reasons people choose this model is its powerful DC motors and its ability to clean all different types of debris from the bottom and the sides of the pool. When compared to similar products at similar prices, I really felt that this product delivered the most bang for the buck, and I was not disappointed when I tested it out. The price is actually very reasonable for how much time you will save compared to similar models! The best feature on this model is its ability to clean all different types of debris from the pool bottom with its four modes, from fine particles of dirt and algae to bigger things like leaves or mulch. In a windy place, this versatility is very important and the Dolphin Premier did not disappoint. It seems to pick up all different types of media equally well, and some other robotic cleaners struggle to pick up larger debris like leaves and sticks. Another feature that I really like is what they call the “Patented 360 degree Anti-tangle swivel.” Older cleaners do not have a feature like this, and almost daily one would have to pull it out of the pool and untangle the cord. This product has gotten tangled a few times, but not nearly as often as other, older cleaners do. 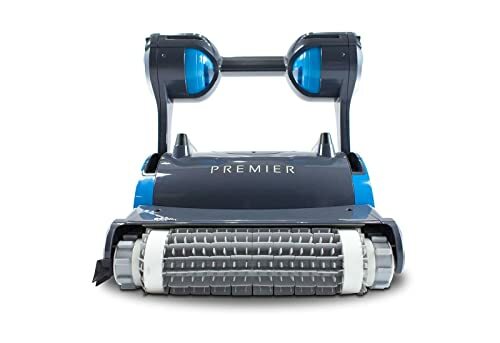 The Dolphin Premier has a three-year warranty, but I doubt there will be anything wrong with it for much longer than that; this cleaner is very sturdy, feels like it’s made of quality materials, and is generally very reliable. I have many ledges and steps throughout my pool, and although this cleaner doesn’t clean the tops of them, it does expertly and quickly navigate around those obstacles. My old cleaner never was able to get the corners as well as the Dolphin Premier does. If you have to manually brush algae and dirt out of corners and along the sides of your pool, this product is perfect for you. You will rarely have to do manual cleaning other than very unique locations. The best feature of this machine is the overall quality of its cleaning. I think that, if put into a completely dirty pool, after running through the different media types, the pool would be clean after only two or three run-throughs. Coming from a much older model to this one, the efficiency of this machine really stood out to me, and I think this will save pool owners a lot of headaches! I do have a few criticisms. First, the instructions included with the product are very bad. It took me a lot of tinkering and research to learn the ins and outs of my new machine. I would recommend owners of this product look up videos on YouTube to get the hang of the operation of this thing, as it can be quite confusing. Also, the manual mode on the robot is all but useless. The remote is slow, confusing, and pretty unresponsive. However, I rarely have a need to use that feature, so it does not really bother me. Another issue is that sometimes the light that indicates the bag is full comes on before the bag is even halfway full. Now, this rarely happens, but on some occasions I have hauled the machine out only to find that the bag has barely anything in it. After resetting the machine, this problem seems to subside. However, I was pretty annoyed a couple of times. All in all, the Dolphin Premier is an outstanding premium pool cleaner, and it is well worth the money that it costs. It is a bit complicated to operate, and there have been a few technical glitches here and there (but what cleaner doesn’t have a few problems like that? ), so maybe this product isn’t for the technology illiterate people of the world. But if you have a big pool, one with unique curves that are hard to clean, and you don’t mind spending a little time customizing your machine, then this is the perfect product for you. I would rate this machine 4.5 out of 5 stars.